These words in this blog are being written under my own opinion and not fact. While I hold my own opinion in the highest regard, I’m self aware enough to understand that I have imperfections and am not immune to corrections. I also fully acknowledge that taste is subjective. Having said that, I consider my opinion to be the only correct one on the matter. Black and white cookies are fine. 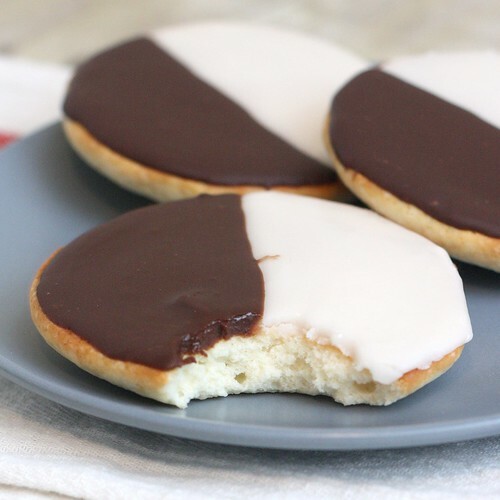 I want it make that abundantly clear that I don’t dislike black and white cookies. But I’ll never seek them out. And I’ll almost always pass up on them for another cookie. If it’s the only cookie around, I’ll probably dabble but there are so many more superior cookies out there. To name a few, chocolate chip, sugar, snickerdoodle. Those are often found in the same place and black and white cookies. Also in the same selection could be the sugar cookies with M&Ms or rainbow sprinkles. I’ll take those any day of the week over black and white cookies. They taste good. How bad can a cookie be? My biggest gripe with the Jews’ favorite cookie is that they don’t even seem like cookies to me. The cookie part doesn’t produce crumbs like a cookie should. It’s more like a firm, cake-like consistency. It’s a completely different cookie experience. I have a hard time understanding how they’re held on such a high pedestal when there are SO many better cookies out there. I take no issue with anyone who enjoys them, but it’s a situation where they get too much love and respect, and I just don’t get it. Totally agree, when I was visiting in NYC a friend who lives there told me I just had to try one, the place we were near made the best in the city. Meh. It’s like plain bland white cake, with an icing that just tastes like pure sugar. Even the chocolate side, I couldn’t taste much chocolate, mostly just the sweetness.